It never ceases to amaze me how God can use just the most ordinary things to speak to me. I'm talking about really ordinary things. Like vacuuming the kitchen floor. Really, God? I have one of those hard floor cleaners that works best if you dry vacuum first and then wash. The dry vac has nowhere near the suction of a regular carpet vac, so I find myself going over and over in the same spot to pick up larger pieces of dirt, small paper scraps, etc, until I finally give up, bend over, and put it in the trashcan myself. At any rate, I had gone over a small piece of foil a few times and the vacuum finally sucked it up. Victory! I continued to vacuum along my merry way (actually, I HATE cleaning the kitchen floor so I was not merry at all), when lo and behold, the vacuum regurgitated the same piece of foil back onto my floor. It had actually never gotten sucked up, but probably just loosely stuck on the brush. I picked up the foil, but it in the trash can and then God spoke. How many times have you convinced yourself that you have gotten rid of a bad attitude or a sinful behavior, just to have it crop right back up again -- regurgitating itself right back into your soul? How many times have I promised myself that I wouldn't yell at my kids? Nag my husband? Gossip? Use passive-aggressive tactics? Use food to fill a need other than hunger? Worry? More times than I've cleaned my kitchen floor, I'll tell you that. I still struggle at times with all of the above. Recently someone asked me to do something that I really did not want to do. I hemmed and hawed about it, venting to my husband who stood over my shoulder to make sure my emails weren't excessively aggressive or something like that (who, me?). I came to the point where I just had to accept it, do it, and do it with a good attitude (not the, "Well, fine, I'll do it, but I AM NOT GOING TO LIKE IT!" attitude). I wanted to desire to do it because it was the right thing to do and leave all the other stuff behind. So I prayed, and really released it. And during a long, hot bath, my feelings of animosity left my heart -- a gift from God. A true change, a true shift. No negative feelings left to be regurgitated onto the floor of my soul. I wonder how many times I have asked God to change my heart and then justified every reason why He really didn't need to change me at all. But God, my kids' behavior is just so frustrating -- I can't help but yell! How else will I get their attention? So, I'm going to pick one of these things that always seem to reappear after I think I have done away with them and really release it. Really. Really. Oh, this is going to be hard. Even figuring out what to choose will be hard. The other day I was blissfully happy as I was washing away the grime from the day -- that yucky combination of make-up, dirt, and maybe even some sweat -- off my face. 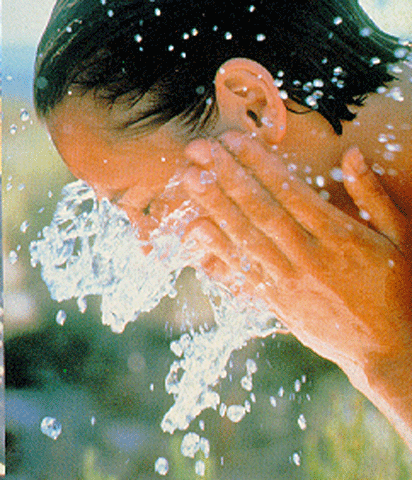 I then patted dry, applied my nightly moisturizer, and feeling completely clean and refreshed, I looked in the mirror. Here ends bliss. No longer did I feel clean and shiny, but deflated, disappointed, and maybe even (gulp!) ugly. All I could see were my imperfections. Wrinkles! Pimples! Stray eyebrow hairs! Oh my! I thought how nice it would feel to be completely clean and beautiful all at the same time -- refreshed, pure, unadulterated. Ready to face the world. I guess if this actually happened to many people, the cosmetics companies would be in the toilet. So, at least I don't feel alone in this place. I have fellow sufferers, I'm sure of it. Anyway, I thought how much this contrasted with how God views my heart. When I confess, when I seek to clean the grime out of my soul, renewal happens. I am shiny and spotless, completely cleansed by the blood of Jesus. There are no more blemishes to cover up, no wrinkles left unsmoothed, and my sins are carefully plucked from my heart. Simply put, I am beautiful in the eyes of God. In fact, it is when I try to cover up my sins, my beauty becomes tainted and the radiant glow of Christ that shines through me, begins to dim. Coming to this realization did not make me feel any better about the physical appearance of my face. However, it did make me realize how differently God operates as opposed to the world. It did make me pay a bit more attention to the matters of the heart. I appreciate greatly, the knowledge that I am loved, wholly and completely, by a God who desires righteousness, unconditional love, and selfless kindness. And He will claim me, blemishes and all. I have spent the last two days in my yard weeding and clearing out my flower beds. Ever since I have started messing around in the yard, I have found that God has spoken to me while I am gardening. In fact, it has happened so many times that now I find myself poised to listen to that still quiet voice while I am up to my neck in mud and allergies. I felt like I should have written this blog entry last night, but realized that would entail being very open about my weaknesses. Who wants to show their weaknesses? But, in (ahem) unearthing them, they are forced into the light. And, where there is light, there is darkness no more. So, here it goes. While I was pulling up the weeds, my daughter was asking why I had to use the shovel. I told her that in order to make sure the weed was completely gone from the ground, I had to make sure that I pulled it up by the roots. Otherwise, even though the top part was gone and I couldn't really see it anymore, by leaving the roots, it was just like an invitation to grow again. It wouldn't really be gone. As I went back to work, God started to nudge my heart as I was pulling out a particularly gross one -- you know, the kind that is so spiny and prickly it can get you even through your gardening gloves -- and I felt Him say to my heart, "That is your competitive spirit." Ouch. Physical and spiritual ouch. I have tried time and time again to not be so competitive, to not pay attention to who does what better than me, to who has more than me, to who seems to have it all, but time and time again I have failed. I think all those times I had just been lopping the top of the weed off, but the roots were still firmly entrenched in the soil of my heart. Here is the insidious root -- I have learned to never be satisfied with what I have right now. I have not found full security and peace with who God has created me to be. I have looked to other things to fill places in my heart that only He can fill. Sounds like a pretty big root. But, ironically, it doesn't seem too big to handle because I know that God works on it piece by piece to loosen it from the ground. And just like any gardener knows, you have to clear out the weeds before you can plant your new flowers, lest the new blooms get choked out. So just as I look forward to my garden being full of new life and wonderful color, I know that God is preparing my heart to be the same way. At least, this is the outlook I have now -- when the pulling actually starts to occur, we'll see if I'm still so cheerful. I've always known that my grandmother is an amazing person. She is kind and loving and giving. She never stops hoping, never stops seeking, and makes conversation with anyone. I used to wonder how she could walk into the grocery store and know to ask after the cashier's child who has a mental disability. Frankly, sometimes I thought she was silly for striking up some of the conversations she did. I mean, she lives in a big city, not some small town where everyone knows everybody. What was the point? To a be a blessing to everyone that crossed her path. That's the point. Oh and how it comes back around. She is dying of cancer right now, physically incapacitated and unable to leave her bed. As I sat with her, we were talking about some of the people who had been by to visit her. Of course, loads of family and friends from her church. But when she said two people from Food Lion (her local grocery store) and one from Belk's (the department store where she shops), my jaw dropped open. I tell you, I've been shopping at some of the same stores for quite awhile and none of them would be visiting me on my deathbed. They don't know my name much less my phone number! But, oh, these ladies care for her deeply because she first cared for them. How many times do I sigh loudly when the checker at the store is slow? How many times do I get impatient with the customer service rep when they can't answer my question or when my order doesn't come? (I even know better than to do that, since my husband works in customer service.) To my grandmother, it seemed that there was no one that wasn't worth caring about. There wasn't anyone that wasn't deserving of a smile or a kind word. Building those relationships was like a second nature to her. She never asked for anything in return, but God has allowed her to see the fruit of her blessings as they stream in one by one to visit, to bring food, to sit with her a spell. I can only hope to have half the visitors that she does, as the glow of my heart just pales in comparison to hers. When she dies, I will only have memories and her inspiration to take with me. She inspires me to carry on her legacy -- to care about those normally ignored, to smile even when I have every right to be angry, to hope even when I am drowning in hopelessness, to love like there is nothing more important in the world. 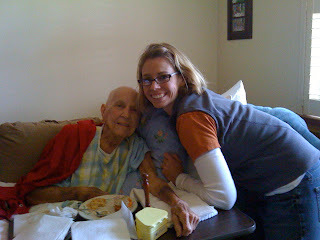 Tomorrow I am headed to across the country to see my sweet grandmother. 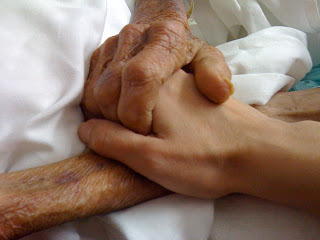 She has not been given long to live and this is my last chance to say good-bye. The last time I went to see her by myself, as we were flying in, we hit a rough patch of turbulence. I remember thinking how grateful I was to be alive (I know, a bit dramatic sounding) and finally home again. I was consumed by the thought of leaving my family behind -- namely my husband and two small children. What would they do if I died? Now that I am about to leave again, I find myself completely fearful of dying on my trip -- on the airplane, while on a run, driving to the grocery store. I realize in my head that this is completely irrational and that the chances of me dying in my hometown are just as likely (if not more so) than dying in Florida. I also know that there is no way that I can cancel this trip -- how does one refuse their dying grandmother's last wish to see her granddaughter one more time? If I continue to allow this fear to fester, all I do is allow Satan to rob me of my joy -- the joy of spending precious last minutes with one of my favorite people in the entire world.